GetRight is a fast, safe and easy-to-use download manager and accelerator available for Windows. The Windows application is intended to optimize and download files effectively. Apart from benefitting users with ultimate downloading speeds and a well-organized UI, the download management utility come packed with a lot of interactive features, which make it popular download management choice among Internet users. Download GetRight for free to start downloading all your favorite files like a pro. GetRight offers compatibility to all popular browsers like Internet Explorer, Mozilla Firefox and Opera; which means you can use the download management software in line with any of your favourite browser. Also, the application user-interface is quite interactive and enjoyable at the same time. The download management utility for Windows speeds up your download by searching for additional sources for a particular file and then splitting the download into multiple segments, with each segment having its own source. In this way, the load upon a particular source is severely decreased and the files are downloaded at a much faster rate. The downloading utility features a highly-customizable interface. It lets you choose from multiple toolbars and buttons, report columns and speed graphs; and personalize things in your own way. Along with detailed settings like Monitor browsers, speed limit, download acceleration, mirror search and BitTorrent support; the application also offers a configuration wizard option for beginners. By providing users with the customizable virus scanning option for each downloaded file with the help of available antivirus solution installed on your computer, GetRight ensures that the files loaded on your computer are clean and free from any virus that can potentially put your system in harm’s way. You can also configure the application to automatically download podcasts and add them to the playlist, no matter what media player, such as VLC Media Player and GOM Player, you’re using. GetRight is an ultimate file transfer tool for Windows. It has got everything you look in an ideal free download manager for Windows; a wonderful user interface, support to all popular browsers and above all, tons of customization options. Also, you can easily and effectively manage all your downloaded files. 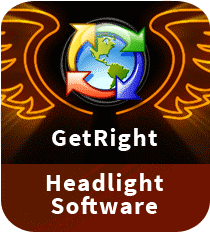 So, if you are tired of using other conventional download management programs for Windows, you can opt for GetRight right now.